Posted on 19/01/2014 by Ed Sutton	in Conversations, Edifice & Artifice, Palaces & Vaults and tagged Mark Blyth, This is Hell!, United States of America. Transcribed from This is Hell! Radio’s 3 August 2013 episode and printed with permission. Listen to the full interview here. Chuck Mertz: On the line with us right now is Mark Blyth. He is professor of International Political Economy at Brown University. Mark is the author of the new book Austerity: the History of a Dangerous Idea. Good morning, Mark. Mark Blyth: Good morning, Chuck. CM: So you write about the Occupy movement, among other things, in your book. You write that “one motivation of Occupy stood out: concern over the income and wealth inequalities, generated over the past 20 years, that access to easy credit masked.” But I’ve been told by plenty of Democrats that nothing came of the Occupy movement, that it was a failed movement, and that because its energy was not put into electoral politics, that is, going out and campaigning for Democrats, it had little—if not zero—impact. So in your opinion, to what degree was Occupy a success in making people aware of inequality? And as that disparity doesn’t seem to be changing, while it may have made people aware, did it have any real impact on government or economic policy? MB: I would say that the negative verdict is probably the correct one, but we have to remember that not everything that flashes onto the screen is going to become the next Rosa Parks. So what did we actually expect from Occupy? What we expected was probably less than what we were given. We thought this was a bunch of malcontents and university dropouts and all the rest of the stuff they were labeled with when it came out, but what we actually had was a quite coherent critique of the contemporary political economy. Now, of course the combination of winter and police actions got rid of the encampments, but we owe them one thing: they were part of putting this issue on the agenda. Let’s not forget that it was just last week that Obama made inequality the centerpiece of a speech—that is in part because Occupy and other movements got it on the agenda. CM: To you, what explains the monopoly that there seems to be on the discussion when it comes to economic policy and austerity? It seems like that is the only solution that we’re being offered, here in the United States: cutting budgets, cutting government spending, cutting taxes, privatizing what were normally government-run institutions. And at least from what I’m reading in the media, that seems to be the only option that Europe has been given, that England has been given. Why is it that austerity seems to have a monopoly when it comes to economic strategies to get us out of the financial crisis? MB: Well, the interesting thing is that while you see this at the state level in particular—where austerity has become an end in itself with crusading Republicans—actually in practice, the United States (the idiotic Sequester notwithstanding) hasn’t cut. And because of that, it has a recovery—albeit faltering, albeit with less job growth than we’d hoped. The Brits, who have all the same advantages as the Americans in terms of having their own central bank and their own currency, decided to cut. Their economy’s flat-lined for five years and they have a six percent budget deficit. Our debt-to-GDP ratio has gone from about 91% down to 71%. So we’re actually accelerating our debt payments because we’re growing. Europe has thrown itself off a fiscal cliff with this, with the result that you have 30% loss of GDP in Greece, 20% in the periphery, and 22 million extra unemployed. That is purely the consequence of this policy. And yet they keep doing it. There is a powerful ideological component. CM: That’s the part I don’t understand. If you’re following any strategy and it continues to fail, why continue to pursue it? Here in the States, we always hear what we need is more tax cuts. And as we get more and more tax cuts and we see the government unable to provide, let’s say, a healthy infrastructure (roads and bridges collapsing, sinkholes), all we keep hearing is, well, we just haven’t cut taxes enough. Is that the same thing with austerity? That not only is there “no solution but austerity,” but there is never enough austerity? MB: Yes and no. A shining example would be Europe. You don’t hear representative [Paul] Ryan standing up and saying, “I think we should go the way of Greece, because look, those cuts have worked out really well for them!” We have a real-world example that this is a really stupid idea. But they’ll keep doing it because the Republicans’ raison d’être is to kill the state regardless of anything that it actually does. The European situation is different; it’s important to understand this. What’s going on in Europe isn’t a sovereign debt crisis. It showed up in the sovereign debt markets, sure, but it’s a banking crisis. And here’s the short-form story: you’ve got a 45 trillion-Euro asset footprint for the combined European banks. Put them all together, you’ve got a $15 trillion economy, so you’ve got a big problem because all those banks are filled up with toxic assets: Spanish real estate loans, Greek government bonds, the whole lot. So when the financial crisis hit, the markets holding those bonds thought, hang on, what if this thing breaks up? So then the yield spikes, and everyone says, oh my god, look at the stakes, we need to get those yields down, so we need to cut budgets. Exactly the wrong policy, because all they really wanted was the ECB—the European Central Bank—to come out and say “we’ll guarantee the debt,” which is what Draghi eventually did…and that’s why the yields went down. Now to get rid of these toxic assets, you need a central bank that can do what Bernanke did: reach in, pull out the assets, de-lever the banking system. But the ECB can’t do that, so they’re stuck. And the people who are the paymasters for this, the Germans, aren’t big enough as an economy to flush out all those toxic assets. So you basically have a stand-off between creditors in the North that have over-lent and Southern economies who have over-borrowed. They’re stuck, so what do they do? They squeeze, they add liquidity and they pray. And that’s what they’ve been doing for the past three years. CM: This week the EU reported unemployment has not gone up for the first time in a while, even though unemployment is still at a record high. We see unemployment here in the United States dipping a bit, in what some commentators are calling “the jobless recovery,” or a “sluggish rebound” in the U.S. economy. We have the Dow Jones hitting another record high yesterday…so is austerity finally working? MB: No, absolutely not. Let’s remember the European case—I’ll quote you some numbers on this one, which would hopefully put this into perspective. The Italian and Spanish economies are going down by another 2% this year. Greece is going to contract another 5% to 7%. Portugal by 3.4%. Greece has actually increased its debt, despite all of its cuts—not by spending (I’ll explain why in a minute)—by 24 percentage points over the past year. It’s really simple—this is the paradox of austerity that most people find difficult to recognize. If everybody is cutting at the same time, then no one’s generating income. If no one’s generating income, any saving has to be zero-sum against your assets. When you’re cutting and cutting and cutting, you shrink GDP, the size of your economy. So the same constant stock of debt gets bigger the more you cut. That’s what’s been happening in Europe. They’ve been cutting like maniacs and the debt’s been rocketing up despite the cuts because the economy that’s able to pay back those debts is shrinking all the time. The notion that this is working is terminal nonsense. CM: You write that austerity creates what you call ‘sclerotic’ private-sector growth. Why does it seem, then, that the private sector is so pro-austerity? MB: Well, it depends who you talk to in the private sector. If you’re talking to anyone financed by the Peterson Foundation, whose sole raison d’être is to make sure there’s no public debt whatsoever so that they never need to pay any more taxes, then that’s what they’re going to say. If you talk to the American Chamber of Commerce, they basically make their money by creating panic so that they can extort more money out of their members. But what is it we actually have, in terms of “private sector?” I go to conferences, I talk to private-equity people, and they’re worried about the fact that they can’t find firms to buy, and they know the number one reason is because consumer demand is low, because people are both de-leveraging—that is, paying back the debt that they’ve already taken on—and because there’s been chronically low wage-growth. They understand there’s a problem and that it’s rational, individually, for any factory to outsource its production to China, but that if they all do that, then there’s no consumption at home to buy the goods that they’re making. There’s a huge collective-action problem built into this. So when you talk to business in the raw, they don’t have this monolithic worldview that gets represented in the media. The people that are paid to represent them do, but that’s their job. CM: So it’s an over-simplification by the media? MB: It’s not just an over-simplification. There are people who are incentivized to tell a certain story. And that’s the story that gets picked up in the media. So you get a certain story in the media all the time that deficit reduction is always good. Well, in principle it is, but if you’re doing it the middle of a recession it creates the very unemployment you’re trying to avoid. So you’ve got to take that next step in the logic, and no one in the media has time in the 24-hour news cycle to actually talk about these things and say, hang on a minute, what happens if everyone saves at once? All you do is shrink the economy. How could you possibly save down without destroying your own assets? Try saying that on MSNBC in a ten-second spot! CM: That’s a good point. You were mentioning how important consumer demand is for an economy. Is what we are experiencing today—thirty-two, thirty-three years after the fact—is this pretty much the evidence that the supply-side economics of Reaganomics, of Thatcher’s economic plans, are a complete failure? MB: Yes, but let me add a qualification on this: I have a feeling that if you got Mrs. Thatcher out of the grave and you showed her the wreckage of the financial crisis and you showed her the size that banks became, and you explained to her that 70% of their profits are made from trading and not from investing in the real economy, if you showed her the salaries they were able to get for hawking derivatives around rather than doing the job of actual investment, I actually think she’d be horrified. I don’t think that’s what they intended at all. But the road to Hell, as you know, is paved with good intentions. So good intentions or bad, supply-side logic or not, we’ve ended up in this place because we’ve financialized the economy, where almost 90% of the gains of the past 30 years have gone to the top 10%—and above—of the population. At the same time, we’ve outsourced middle class jobs. You know this story. The simple fact of the matter is we’re beginning to recognize the consequences of doing this. It all goes back to a very simply idea, another collective-action paradox: that what’s individually rational for a firm isn’t rational for an economy. It’s rational for every single family to save if they’re getting a little bit too much into debt, but if everybody tries that at once, there’s no spending from which the families can save. So if you take this idea seriously, that there’s a kind of paradox in the way that our actions collectively are different from our actions individually, then not only do you see why we actually still have states around despite the fact that we supposedly don’t need them, but we also begin to understand how a bloated financial sector enriches itself at the expense of the economy, and that’s where we need to put the focus. CM: You were saying how austerity is really driven by a political ideology. Do you think the politicians who are pushing austerity—are they true believers in austerity, or are they purposeful manipulators who are trying to scam the public? MB: Well, why not have both nefarious reasons? On the one hand, I’ve met people who really are true believers—take Britain for example. Britain taxes and spends over 40% of GDP, and the quality of public services and the quality of infrastructure is terrible, in this expensive place. So it’s actually a legitimate thing to turn around and say, well, why are we spending all this money? Why am I giving up almost half my paycheck and what I get out of it, at the end of the day, isn’t very good? That’s a reasonable point of view; I don’t think there’s anything wrong with it. But does it automatically mean, therefore: we’re in a recession, let’s cut government spending by 20%? No, one doesn’t follow from the other. There are people who take the Grover Norquist line, who’ll do anything to drown the federal government dead in a bathtub. They’re certainly there. There are people that think that government is too big and things could be spent better in different ways. But the key thing is the commonsensical notion of this whole thing: “We spent too much and now we need to spend less.” Whereas if you look at Europe, for example, Ireland and Spain—two of the epicenters of the financial crisis—their net debt-to-GDP ratios were 13% and 26% going into the crisis. They didn’t spend. Their spending track was going down for the whole of the 2000s. The reason that they ended up with so much debt is because they had to bail out these bloated financial sectors. Having done so, the people who have all the assets and all the income, and just got bailed out, turned around and said, “look at all that debt! That’s terrible! Now we need to pay that back!” Only they’re not going to be the people paying it. The people who are going to be paying it are the ones who consume government services, everybody else at the other end of the income distribution. This is the greatest bait-and-switch in human history, and that’s the bit that, for some bizarre reason, doesn’t get publicized. CM: You write, “austerity clearly is not working, if ‘working’ means reducing the debt and promoting growth. Instead, in making Portugal, Ireland, Italy, Greece and Spain’s bonds riskier—as seen in the interest rate change—the policy has indirectly made European banks that hold lots of bonds (mainly in Germany, France and Holland) riskier in the process.” So it seems, from what I’m reading in your book, that austerity hurts banks, hurts governments, hurts the private sector, hurts public workers, hurts demand, hurts business…so who’s cashing in on austerity? Just politicians who win votes with this ideology? MB: Well certainly in Brussels you’ve got a bunch of people who for the past 25 years have been getting paid six figures to hawk this project called the Euro and European Integration come hell, high water, or the outcomes that it actually produces. So there’s certainly some very instrumental actions going on here. But think about it this way: so you build a big system with this Euro, and everybody starts borrowing in the same currency—that none of them print. So long as the credit flows are going around so that surpluses in Germany—because they don’t consume enough—are getting recycled in the bond markets and local finance markets in the South, and they’re using them to buy BMWs, everybody’s happy. But, as the old line has it, once the music stops everybody has to cash out. And suddenly it looks like all those banks in the North have massively over-lent to people who are never going to give them the money back. Whenever this happens, the creditors try to squeeze the debtors. But at the end of the day, the creditor always ends up paying. It’s just a question of how much. And the Germans and others in the North are determined to pay as little as possible. The bill is enormous. CM: You know, whenever I post on social media that it all relates back to a banking crisis, I always get someone who comments that the whole financial crisis of 2007-2008 was because poor people were buying homes they could not afford. Why blame what’s happening on the banks and not on the poor people who bought homes, then couldn’t pay the banks? MB: My answer to that—because I get the same thing all the time—is the following: there’s about 12 countries that were directly negatively impacted—losing 3% to 5% of GDP—in the financial crisis; about nine of them had housing market problems. And only one of them had a Fanny and Freddie. So if Fanny and Freddie are the problem, why is it a global problem? Ireland didn’t have a Fannie and Freddie. Spain didn’t have a Fannie and Freddie. And their housing problems are multiples of the United States. Here’s a question for you, Chuck. Do you remember the world’s first $1 billion advertizing campaign for a bank? It was a slogan for Citibank between 2003 and 2006. Do you remember it? Don’t be rich, don’t save up and buy yourself something nice. Live richly. Unless somebody is over-lending, it is manifestly impossible for people to over-borrow. So let’s be symmetrical in our judgment here. Why would the banks give money to people that they knew could never pay back the mortgage? Because they were securitizing it and passing it on to some bigger fool. The problem was, everybody was holding the garbage, so everyone was the bigger fool. What starts with the banks, stays with the banks, ends with the banks. Period. CM: You write, “the U.S. banking system, the origin of the global banking crisis, was doomed by the U.S. government to be ‘too big to fail’ and therefore wasn’t allowed to fail when it got into trouble in 2007 and 2008.” So are the conservatives right when they say this financial crisis was all the government’s fault? MB: Again, you have to be symmetrical. We certainly got through the Commodities and Futures Modernization Act, we got rid of Glass-Steagall, the regulators were basically bending over backwards to give the banks whatever they wanted. Because who’s financing the campaigns of the politicians appointing the regulators? That would be the banks. So if everybody’s in bed with everyone else, why single out one person in the bed? Again, there’s demand and supply. There’s over-borrowing as well as over-lending. And for the state to incentivize and allow things to happen, they have to be incentivized to do that themselves. And when you have one of the most powerful lobbies on the planet, Global Finance, paying for your campaigns (or threatening not to)…it’s kind of easy to blame the state, but let’s look behind the curtain and see who’s pulling the strings. CM: How much does the argument that it was either the government’s fault or the banks’ fault, the public sector or the private sector, how much does that undermine Americans’ understanding of the financial crisis? MB: Let’s think about it this way: did the state enable this to happen? Absolutely. Could the state have engineered the housing bubble? Absolutely not! You could only do that with credit, and you only get credit from the banking system. The government does not hand people checks to do housing projects. You might underwrite mortgages, but the reason you’re doing that is to lower the cost of capital, which ends up adding to the banks’ bottom line, which allows them to issue more credit. So what begins in the banking system ends in the banking system. What we’ve done in the United States is we’ve basically forced the de-capitalization and de-leveraging of our banks. That’s what Bernanke’s been doing, and it’s been remarkably successful; they’re starting to lend again. Because of the way they designed the ECB and because it’s not one single government, the Europeans can’t do that trick. So they still have all the toxic assets sitting in all the banks, but they don’t have their own national currencies and they can’t fix it. It’s qualitatively different but they’ve got one thing in common: what starts with the banks, stays with the banks, ends with the banks. CM: Let’s get away from if it’s the American government’s fault or America’s banks’ fault. Is this America’s fault? MB: It may have been triggered from housing in the United States, but it might have started off with another trigger. It could have been collateralized loan obligations on student debt, it could have been car loans, it could have been the bankruptcy of a major normal bank institution as opposed to a non-bank institution like Lehman Brothers. The whole system was hyper-leveraged, super-connected in ways that people couldn’t perceive, and we’d told ourselves this story that derivatives make the world safe. That everyone can push risk around and ultimately it somehow disappears, as long as you don’t ask who’s actually holding it. And it turned out everyone was. That was the problem. Also, that “the smartest guys in the room,” all the talent has gone into banking over the past 30 years—because of the outsize rewards—is one of the biggest problems that we’ve got in the financial crisis. Our engineers are not engineering tech against global warming, they’re engineering derivatives because the rewards are so outsize. So these are the smartest guys in the room—didn’t they see this coming? Oh, yes they did. They knew that by becoming so big, that if they failed, that they would be bailed out, and the cost of that bailout would be borne by everyone else. CM: You write that it’s all about saving the banks—austerity, particularly in Europe, is all about saving the banks. To what degree are Europeans aware that it’s all about saving the banks? Is that as misunderstood there as it is here in the States? MB: Yeah, it’s completely misunderstood, because no politician has an upside to standing up and telling the truth. Think about it this way: in 2006, how many congressman do you know—Democrat or Republican—that said, “look, you know, I’m using my house like an ATM machine. I’ve never had so much money. My cat is making out on the stock market. So how about we just stop for a minute and we pay back some debt? How about it? We’re a bit worried about national debt. Let’s pay back some debt.” They would have been voted out of office in a heartbeat, because everybody wants all of the goodies and nobody wants to pay for anything. They’re fiscal teenagers. That applies to voters and politicians. So when the bubble pops, then the fingers start getting pointed. That’s where we’ve been. And the only functioning part of the U.S. government, for all the critique heaped upon it, has been the Federal Reserve, because Congress has been utterly gridlocked. And the Europeans didn’t even build fiscal institutions because they’re not an actual country. So what you’ve had is half a central bank in Europe that can’t do its job properly, and the U.S. central bank essentially cleaning up the largest financial mess that’s ever been created. To think Bernanke’s going out with a tarnished reputation in some quarters! I think he’s done an astonishing job. MB: Given the situation he had and the tools that he’s got. All he’s got is liquidity tools; he has no fiscal tools. These are fiscal problems. We should have supported private sector de-leveraging with massive government spending, because the yields on American bonds never went up, they went down through the whole crisis. It would have been the cheapest borrowing we could have ever done. And as we’ve shown, you can start selling those toxic assets back to the banks themselves for a profit when the whole system recovers. Now you’ve got a moral hazard problem deep within the banking system. When you’re too big to fail, you’ve got a free option, a guaranteed insurance policy in the public, and I think that’s wrong. I don’t think banks should be too big to fail, I think they should be broken up so they’re competitive units and when they fail, they fail on their own terms and they take down their investors. We shouldn’t guarantee investors, we shouldn’t guarantee bank debt, and that’s what we’ve been doing. That gives them an advantage over everyone else and we’re paying the cost. But that notwithstanding, the cleanup has been remarkably good, despite the fact that all that’s been done is by a central bank, because Congress has been utterly gridlocked and unable to do anything. CM: What about the solution that was offered by many progressives shortly after the financial crisis began—they wanted to have the U.S. government nationalize the banks. Would that have been a good idea? What would have happened if we had nationalized the banks? MB: Well, you would have ended up privatizing them again. Things get stable, the Republicans foam at the mouth, and then you privatize them again. And then when you privatize them, you privatize them at less than market value and the insiders take all the gains. What would be the point? You want to keep them permanently nationalized? Are you going to have a national credit system? Well, there’s a downside to that, too. How do you respond to different market dynamics in different areas? Are you going to have a huge new federal bureaucracy to decide who gets car loans? Now a simple one would have been simply bring back Glass-Steagall, make it apply to the non-banking sector as well as the shadow banking sector, and basically make sure that no firm has an asset footprint more than $500 billion. And then they don’t become too big to fail. Hell, make it $250 billion. That way they can fail on their own terms, the investors get the payoff but they also bear the risk, and the financial sector actually is competitive rather than oligopolistic as it is now. CM: Can the system still be saved by bringing back Glass-Steagall? MB: Not just Glass-Steagall. Think about Dodd-Frank. People are like, “what a terrible, terrible, thing. It’s been captured by the lobbyists.” 2,200 pages of legislation. What a load of nonsense. What they forget about it is, this is de-leveraging by a thousand cuts. See, if I run at Jamie Dimon or one of the big Wall Street guys with a rule that says you can’t lever up more than twelve to one, and your bank can’t be bigger than $250 billion, he will take a billion dollars of lobbying out of his back pocket and he will kill me. I will never get elected to city dog-catcher once he’s done with me. So you can’t do that. You can’t fight a war of position. You’ve got a fight a war of movement. How do you do that? You drown him in regulation. You raise his compliance costs through the roof. You escrow his bonuses. You make sure that his traders have to document everything that they’re doing. You make sure that they can only get paid a certain multiple of salary. You increase the marginal tax rate on the business. You do all these things to make the same result. You get them smaller, you get them leaner, and you get them out of certain activities. You post derivatives on exchanges, you make the prices transparent, so that you shut down a large part of the unregulated derivatives market. And that’s what Dodd-Frank’s doing. So a combination of this plus the basic bankruptcy of the big banks’ business model—which basically is where we are now—means that these guys are changing because of good old market forces plus regulation. CM: How exaggerated, then, is the problem of debt? MB: I think it’s woefully exaggerated. The United States is de-leveraging too fast on the public side. You’ve got to remember it’s relative to the size of your income. The United States hasn’t paid back its Civil War debt yet. “Oh my god, that’s terrible! We should pay back the debt!” Why? The economy is a hundred times bigger, so the debt’s a hundred times smaller. This is stuffing nonsense. If you stand in Times Square and look at the debt clock, it looks like a big number, until you recognize the fact that the economy is bigger than the number. And if the economy grows faster, the number can continue at that rate, and it’s becoming a lesser proportion of your GDP. That’s all that matters. And when you print the global reserve asset, when the only other contenders are a Chinese currency that doesn’t really exist as an internationally traded currency, that nobody knows the true value of, because nobody knows what’s going in the black box called China itself; you’ve got the Euro that’s self-immolating 20% of their GDP, so forget holding that, the only reason their exchange rate hasn’t moved is because of tacit cooperation among central banks not to dump the currency, because it would ruin them all in the process. So what have you got left? You’re left with the mighty dollar. And the mighty dollar’s yields are still 2% to 3% on a tenure. I mean, what exactly is the crisis here? The crisis is a complete fiction of politics. CM: You write that even the top 1% will eventually “feel the consequences of cutting state spending as the impact of austerity ripples back up the income distribution chain in the form of lower growth, higher unemployment, withered infrastructure, and even more skewed distribution of resources and life chances. In essence, democracy, and the redistributions it makes possible, is a form of asset insurance for the rich, and yet through austerity we find that those with the most assets are skipping on the insurance payments.” Is that what we have to wait for in order to stop austerity? For it to finally affect the rich after it has already damaged the rest of us? MB: Unfortunately that may be the case. I like to point out to very rich people when I meet them that the Hamptons is not a defensible position. At the end of the day, you’ve got to think this way. I’ll give you an analogy. There’s a country that has a worse income distribution than the United States (although people should remember the United States has gone from being one of the most mobile and relatively equal societies in the world to having the same income inequality as China. So let’s think about where we are today). But Brazil was worse. And Brazil got so bad that their top 1% basically lived abroad, and invested abroad, and starved their own economy, and they lived in compounds with armed guards and private security, and kidnapping was the number one threat. Eventually they decided that there had to be a better way. And there was. They did a deal with Lula and the PT, the Workers Party, and they did a deal with Cardozo before that, and in exchange for lowering inflation they paid more taxes and allowed more progressive policies. And because of that, the income distribution got better, and what’s the economy that everyone’s been talking about for the last ten years that’s been growing fastest? Brazil. CM: Right. Mark, one last question for you. It’s the same thing we do with all of our guests, we give them a Question from Hell. It’s the question we hate to ask, you might hate to answer or our audience might hate the response. I get plenty of emails like this: “the whole financial crisis isn’t because of the banks, it’s not because of the government, it’s not because of poor people, it’s not because of austerity. 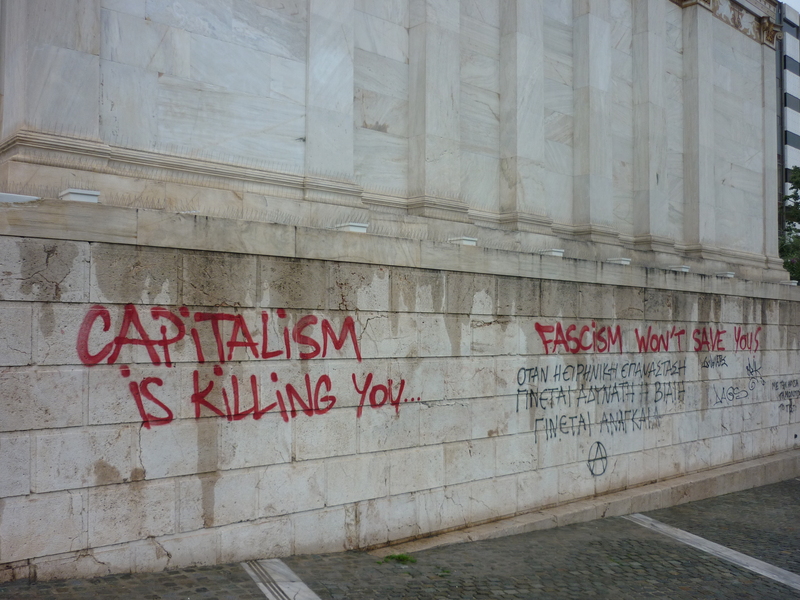 It’s because of capitalism.” Is this all capitalism’s fault? MB: It absolutely is. But you know what the problem with that answer is? Capitalism is us. It’s everything. It surrounds us, it’s every institution on the planet. It unites us all, it’s the cash nexus, it’s the money pit, it’s everything. So basically what you just said to me was, “you know what the crisis is? The crisis is life.” And I agree. The crisis is life. CM: This was such an enjoyable interview. I’m glad that there’s somebody out there who’s saying something that seems logical. I cannot thank you enough. MB: It was great. Call me any time.